Provides the historical and cultural context for understanding the community’s ability to be both the most tradition and most rapidly changing in its regions. Details the impact of the Spanish Conquest and the continuing struggle during the 21st century in adapting to globalization and to preserving key natural resources, especially their forest and water. 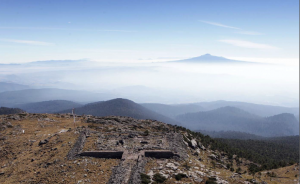 The deep history of the highlands of central Mexico is shrouded in mythology, dramatic archaeological remains and recreated pictographic documents crafted after the Spanish conquest of what came to be known as the Aztec Empire. As Eduardo Douglas notes in In the Palace of Nezahualcóyotl (2011), the term “Aztec,” literally means “person of Aztlān,” with Aztlān referring to the mythological homeland of the Mexica peoples before they migrated to the central valley of Mexico sometime in the 13th century. Figure 3.1 – The Central Valley of Mexico at the eve of the Spanish invasion, circa 1519. 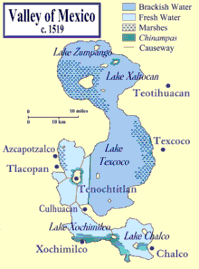 The Alcolhuan domain refers to the state in the eastern part of the valley of Mexico ruled by Texcoco. Much of the information about this area and its early history comes from the following historical documents linked below. A set of early colonial documents, the Codex Xolotl, the Quinatzin and Tlohtzin maps were created in the 1540s to depict the pre-conquest history of Texcoco, especially its royal dynasties. 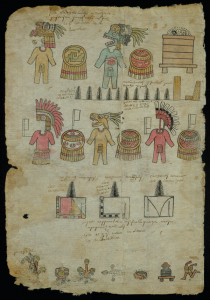 Added Value: Key resources for understanding pre-Hispanic and early colonial documents. One of the best sources for understanding early documents relating to the Nahua people shortly after the conquest is found at the Mesolore: http://www.mesolore.org. This site deals with the Indigenous Pre-Hispanic Context of MesoAmerica. It is particularly good in helping students understand the imperial states in which communities like Amanalco co-existed before the Spanish invasion of central Mexico. It is a great resource for explaining the nature and use of Pre-Hispanic books or codices. See especially The Matrícula de Tributos (“Register of Tribute”) which consists of 16 sheets (“folios”) of paper made from the bark of the amate tree. The discussion of this document helps students understand the economic ties of communities and regions to the Aztec state and capital at Tenochtitlan prior to 1521. Issue of Law – http://tarlton.law.utexas.edu/exhibits/aztec/ Aztec and Maya Law: An Online Exhibit and Bibliography, This online exhibit and bibliography is a collaborative project of Tarlton Law Library and the Benson Latin American Collection at The University of Texas. Three of the major cities in the Alcohuan domain were Texcoco, Coatlinchán and Huexotla. In the following video Professor Tomas Martinez Saldana provides a tour of the pre-Hispanic archaeological zone of Huexotla. Carmack, Robert, Janine Gasco, Gary Gossen, eds. 2007. The Legacy of Mesoamerica, 2nd edition. Upper Saddle River, NJ: Prentice Hall. Frederick Hicks, 1982. “Tezcoco in the early 16th century: the state, the city, and the calpolli.” American Ethnologist, 9(2):230-249. Magazine, Roger and Tomas Martinez Saldana, eds. 2010. Texcoco en el nuevo milenio: Cambio y continuidad en una región periurbana del Valle de México. México, D.F. : Universidad Iberoamericana. Magazine, Roger. 2012. “The Village is Like a Wheel”: Rethinking Cargos, Family and Ethnicity in Highland Mexico. Tuscon: University of Arizona Press. Kearney, Michael (1996) Reconceptualizing the Peasantry: Anthropology in Global Perspective. Boulder: Westview Press. 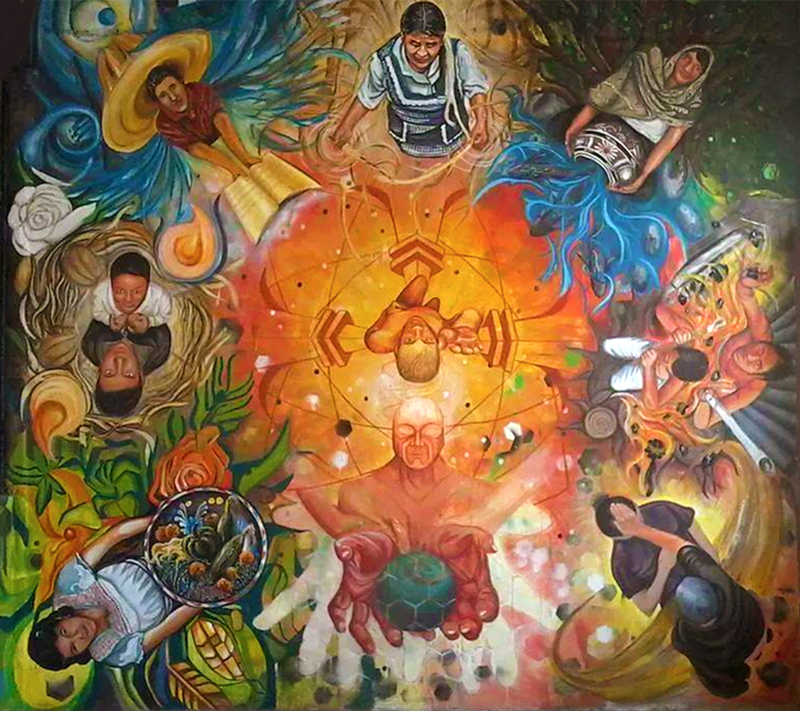 Largely developed in the 17th and 18th centuries, these syncretic cultural patterns range from forms of music, such as the contemporary “Aztec bands” to fiestas celebrating Catholic saints, ideas about sorcery and constructs surrounding health practices. Such cultural practices are anything but static and some are either withering away or, more likely, being adapted into a form more appropriate for contemporary life. In 1972 I photographed and recorded the sound of an “banda Azteca” playing in front of Amanalco’s church Click to hear the music. You can also find some information on this continuing tradition clicking here for a short article by Mexican anthropologist. The taking of the Aztec capital is an amazing a story as was the very founding of Mexica political state in the 14th century. At one level it is tale of incredible personal determination, hardship and risk taking on the part of Cortez and his band of sailors and mercenaries who had been forced out of Tenochtitlan two years before by a rebellion of the Nahua urbanites. Here a group of less than 500 men subdued, with the help of newly introduced diseases and Indian allies, a city of 200,000 which was far larger than any city then existing in 16th century Spain. At another level, it was part of what seems now like an inevitable process of European global expansion by which state sponsored voyages of colonial conquest toppled once powerful indigenous states and usurped raw materials and labor power which become the economic building blocks of the Western Enlightenment period. The conquered Aztec capital which had a feared dominion over a good portion of Central America was eventually transformed into the center of an expanding Spanish domain. Cortez spent the first several months after his victory leveling Tenochtitlan with canon fire, beginning to build catholic churches and cathedrals and rebuilding the first Global City in the Americas – Mexico City. This was not a simple matter of replacement but part of what has been called the Great Columbian Exchange, whereby the biological, spiritual, architectural, medical and agricultural patterns of Europe and the Americas collided and blended in the most extensive such interchange yet experienced by peoples on our planet. Amanalco is one of a handful of communities situated in small valleys at the edge of the rugged high Sierra ecological zone. Along with Santa Catarina, Santa Maria Tecuanulco and San Pablo Ixayoc these are the only places in the area where Nahuatl is still spoken. Along the central artery leading into the plaza and above it on this major street, one finds the greatest concentration of commercial establishments. In 2010, the plaza was in rather shabby condition compared to four years previous. However, on Sundays it became a vibrant market with fruits, vegetables, made-on-the spot delicacies, music and video recordings and household supplies. The main road into Amanalco also serves as a rough dividing line between two named geographical zones – on the north is Santo Domingo, also called Serrano (mountain), and on the south is San Francisco, also called Caliente (hot). I was told that as the population started to grow rapidly in the 1950s it seemed necessary to get a more equitable organization of alternating community service in the civil and ritual positions undertaken by citizens. This high zone ascending toward the sacred peak of mount Tlaloc (also called El Mirador) at 13,615 feet, is a key cultural space where the magical imagination of residents takes flight. Many stories that I heard began, “I was working up in Kwoutla (the mountain forest) when…” These tales might entail seeing dangerous tiny beings called ahuake in water ways or noticing colored lights of the blood sucking tlahuelpuche dancing among the hills. Elders recalled the exploits of the god-king Nezahualcóyotl as he challenged the devil to impossible feats within this domain. The PowerPoint below illustrates some of the important resources found in Amanalco’s high forest region. In a 2014 blog interview with Professor Molly Doane she discusses her new book Stealing Shining Rivers: Transnational Conservation meets a Mexican Forest. In Tepoztlán there is a myth of a guardian spirit which protects and unites the larger community with 8 barrios in times of crisis. This has some similarity to the myths about Nezahualcóyotl in Amanalco (see chapter 9). This myth was invoked during what came to be known as the “golf club war” 1995-1997. In this case the residents deposed the local government and barricaded the community after the politicians sold rights to community land for a $500 million golf resort and multinational industrial park. 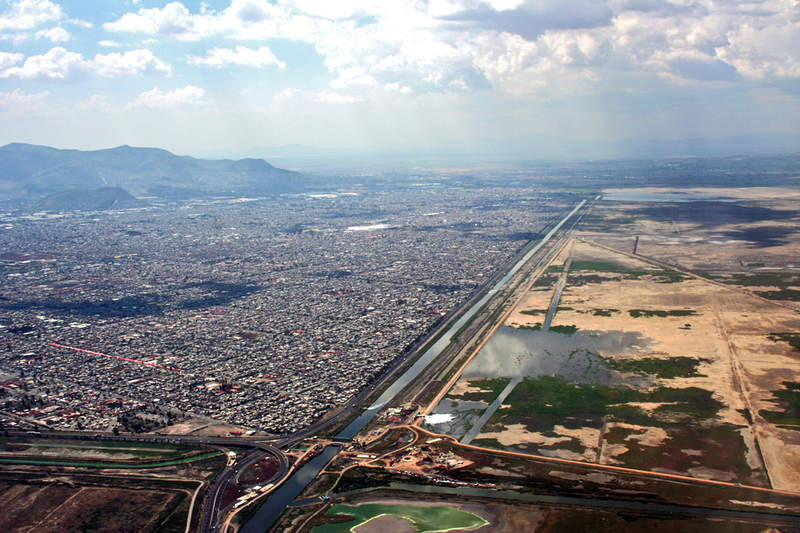 As in the case with Atenco, and its fight against expanding the Mexico City airport onto its lands, Tepoztlán was eventually successful in forcing the corporation planning the project to withdraw its plans.